AIKYA helps to promote the welfare and interests of children with Autism, ADHD, Down Syndrome and specific learning disabilities. To improve the support these children receive, AIKYA provides a wide range of materials for teachers, parents and others who work with children with special needs. We hope this blog will be a valuable resource for parents, schools, teachers, and professionals. Eight kids at AIKYA were eager to listen to the adventures of Kaala, the King Cobra. Storyteller Anitha told the story. As the kids were very young, a recollection of facts was helpful. King Cobra does not have ears and eyelids. King Cobra uses smell and its tongue to catch food. The King Cobra does not eat food daily. The King Cobra hatches from eggs. And so on.... The kids had a look at the colorful picture book. They also created a forest using crayons and sketch pens. The kids drew a tree, river, a King Cobra, and birds. Finally, they mimicked a snake dance pose. It would have been nice to have a real snake charmer around. Alas, you don't find one in streets these days. As the International Year of the Forest draws to a close, Pratham Books has launched the “Awareness Today for a Greener Tomorrow" campaign. As part of the campaign Pratham Books has organised an exciting relay of events throughout December to spread awareness for a greener world. One of the events is the launch of our book “A King Cobra's Summer' on 17th December. Now for a few snapshots of A King Cobra's Summer. Pica is a pattern of eating non-food materials (such as dirt or paper). Pica is seen more in young children than adults. Between 10 and 32% of children ages 1 - 6 have these behaviors. Pica can occur due to a lack of certain nutrients, such as iron deficiency anemia and zinc deficiency, may trigger the unusual cravings. Pica may also occur in adults who crave a certain texture in their mouth. This pattern of eating should last at least 1 month to fit the diagnosis of pica. There is no single test that confirms pica. However, because pica can occur in people who have lower than normal nutrient levels and poor nutrition (malnutrition), the health care provider should test blood levels of iron and zinc. Blood tests can also be done to test for anemia. Lead levels should always be checked in children who may have eaten paint or objects covered in lead-paint dust to screen for lead poisoning. The health care provider should test for infection if the person has been eating contaminated soil or animal waste. Treatment should first address any missing nutrients or other medical problems, such as lead exposure. Treatment involves behavioral, environmental, and family educational approaches. Other successful treatments include associating the pica behavior with bad consequences or punishment (mild aversion therapy) followed by positive reinforcement for eating the right foods. Medications may help reduce the abnormal eating behavior, if pica occurs as part of a developmental disorder such as mental retardation. Treatment success varies. In many cases, the disorder lasts several months, then disappears on its own. In some cases, it may continue into the teen years or adulthood, especially when it occurs with developmental disorders. If you notice that a child (or adult) often eats non-food materials. There is no specific prevention. Getting enough nutrition may help. Art Therapy helps to improve the emotional well being of a person. Art Therapy is a form of psychotherapy. The process of creating or making different forms of art is therapeutic. So, it is "Art as Therapy." There are simple tools to practice Art Therapy. The common ones are Mandala, Magazine photo collage, Masks, and Art Journal. Anyone can learn or practice Art Therapy. There is no minimum educational qualification or drawing skills that a person needs. Attention Deficit Hyperactive Disorder (ADHD) is a complex disorder and each person with ADHD is unique. 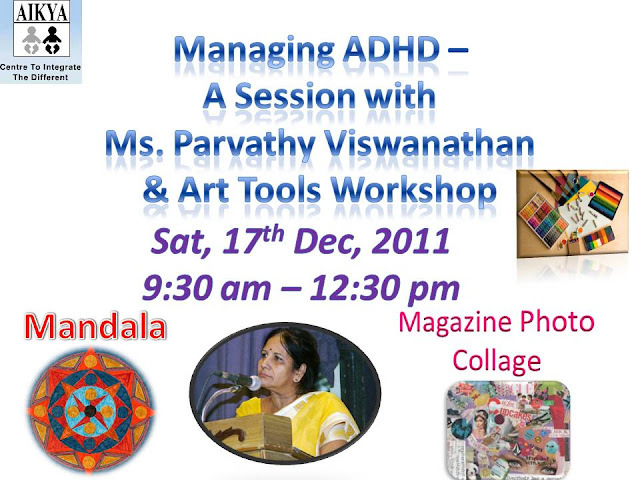 Psychologist Parvathy Viswanth will teach the different methods to handle a child with ADHD. This session will benefit parents, special educators, counselors, and therapists. Mentally Retarded and Mentally Ill - Is there a Difference? Lay people confuse the terms mentally retarded and mentally ill. Mental retardation is a birth defect and is usually found from birth. But, mental illness sets on during or after adolescence, especially after a major setback in life. Mental illness is due to chemical malfunction in the brain and can be cured or reduced with medicines. But , mental retardation can be reduced only by vocational and behavioral therapy. People with mental illness can work in the mainstream after treatment. But, people with mental retardation can only do jobs that match their ability. NGOs working with mentally ill people, demand that mentally ill and mentally retarded must be under the same category and/or premises. But, mentally ill people may turn violent and mentally retarded people who are child-like cannot defend themselves. So, the debate continues. 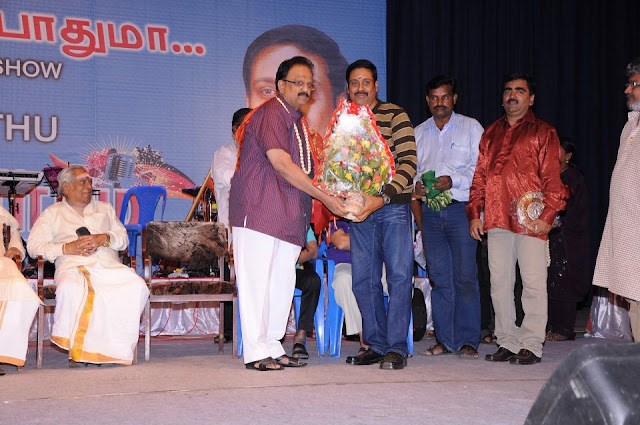 AIKYA honored 30 special people with Advithiya awards. Advithiya means 'Second to None.' Ofcourse, the special people who are educated and employed are second to none. "A great mind imprisoned in a disobedient body" - One of the speakers highlighted how Stephen Hawking, a great physicist has achieved inspite of a neuro-motor and speech disorder. A poor mother in Tirunelveli has four children with special needs. Even though neighbors gave her tips to get rid of the children, the brave mother is helping her children grow well. 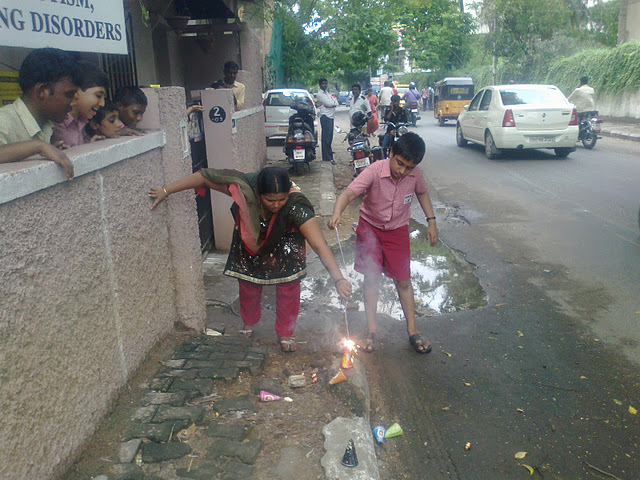 There are many special schools in Chennai, but rural areas lack such schools. One of the speakers said that HR managers in MNCs discourage people with special needs and colleagues tease the special people. Sometimes, the eager employees stop going to work after few days. Proprietors tell that they cannot control the behaviour of all their staff. Sometimes, house owners do not let out houses for rent to a family with a special child. When Chief Guest and IAS Kannegi Packianathan spoke, she recalled how Ms. Parvathy always meets her to discuss about special people. Ms. Kannegi asked the parents of special children to voice their concerns. This confession will help the government in formulating policies that reflect real-world issues. The government has been appointing 'Care Givers' who can take care of disabled people in a home. 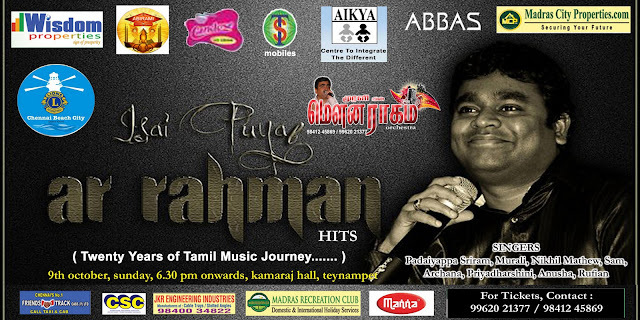 AIKYA will honor achievers with Special needs on 23rd November at Tattvaloka Hall in Chennai. Ms. Kannegi Packianathan, IAS, Secretary for Dept of Welfare for Differently Abled will be the Chief Guest. People with special needs such as Autism, ADHD, Down syndrome, LD and Cerebral Palsy have a social stigma attached to them. Society and employers always have a doubt about how the special people will perform in a job. AIKYA plans to honor around 40+ people with special needs who are graduates and/ or work in a steady job. These are people who have made a mark in society against all odds. The government now gives 3% reservation to disabled people. PWD who get benefits are hearing impaired, visually impaired, and persons with orthopedic impairment. Through this event, AIKYA plans to request the government to give a 1% reservation to the four categories of disabilities namely AUTISM, MR,CP and Multiple Disabilities recognized by National Trust ( a wing of Social justice and Empowerment) . · Customers would love your Social responsibility. · Government recognizes your Goodwill with certain benefits. AIKYA also runs a work centre that trains young adults in making products such as garlands, towels, fancy jewels, incense sticks, areca leaf plates, xeroxing, lamination, computer skills and more. The trainees learn filing and skills reqd for an office assistant. Soft skills like communication, socialization, and grooming skills are also taught. Prospective employers can source trained manpower from AIKYA’s work centre too. Look forward to see you all at the function that starts at 5:30 pm. The Annual Day and 20-year-service celebrations of AIKYA went on very well. Kids of AIKYA danced with karagam on their heads, guitars in their waist, and colorful cloth in hand. They recited numbers 1-10 with different props like water bottles, caps, and flowers. They sang songs. And also did a fancy dress competition and dressed themselves as carrots, cows, and more. Singer Sudha Raghunathan was the chief guest. When she spoke, she asked the audience to give a standing ovation to the founder and teachers of AIKYA. She sang the Bharathiyaar song "Chinanj Chiru Kiliye Kannamma" and became emotional in the end. She also gave chocolates to AIKYA kids. She promised to do a charity show for AIKYA also. 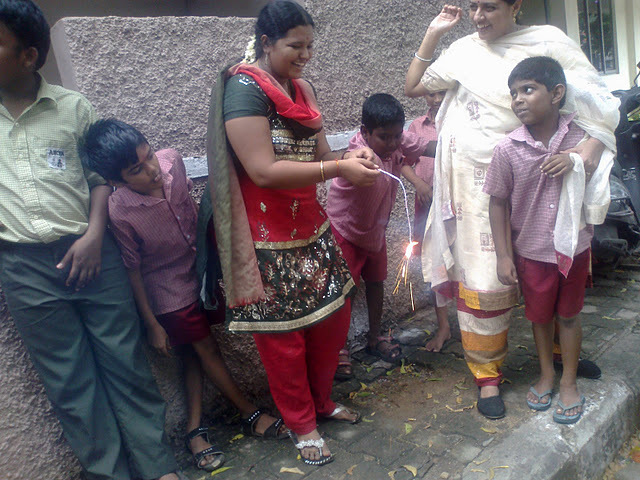 AIKYA founder Ms. Parvathy told that the growth of special children and their parents is the growth of AIKYA. Anitha presented a summary of 20 years of AIKYA's contribution to society. Sudha Raghunathan gave prizes to all the kids. The parents were very jubilant and took photos and videos as their kids performed. Two parents and one grandparent spoke about AIKYA. They told how they had changed their kids to 3 or 4 special schools before they came to AIKYA. After their kids joined AIKYA, they showed a good improvement in social skills, arithmetic, and were eager to go to school. So, 11/11/11 became really special for everyone at AIKYA. AIKYA centre invites you with family and friends to celebrate their 20 years of service and Annual Day on 11th November at Ragha Sudha Hall. Padmashri. Sudha Raghunathan has agreed to be the guest of honor. AIKYA children will dance and sing. Please share the invite with everyone. All are welcome. You can chat online with Lion. Parvathy Viswanth over Skype or Gmail chat on Special needs of children with ADHD, AUTISM, and Learning Disabilities. Ms. Parvathy Viswanathan is the Founder-Director of AIKYA – Centre To Integrate the Different, an NGO that has been serving special children for 20 years now. You can discuss about behavioral problems in children with ID, Early intervention, vocational training, and/or parental guidance. And cover the entire spectrum of queries about people with Special Needs. Parvathy Viswanathan has won several awards such as the Woman of the Year 2000 award from American Biographical Institute, Who's Who Professional and many more. 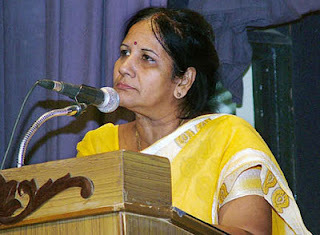 She was nominated as a board member of the Tamilnadu Welfare Board for the Disabled in 2007. She has presented many papers at national and international conferences. She has authored books on ADHD and Autism. She is advisor to many special schools. She has organized job fairs and marriage engagement ceremonies (Naveena Suyamvaram) for the persons with Disabilities. She has conducted Special Olympics for the children with Intellectual and developmental disabilities. And two events have entered the Limca Book of Records. So, never miss this chance of your lifetime. Connect soon with Ms. Parvathy with the chat IDs given for an audio chat. Social Media is no more a buzz word in India. It is now the most crucial word for businesses that look forward to secure their Business Communication's future. SMSin2011 is a 2 day International event organized by EchoVme in collaboration with M.O.P Vaishnav College (Department of Commerce). The growth phase of Social Media is augmenting rapidly as we see more than 200% usage of Social Networking Sites year on year since 2004. India has emerged as one of the leading Internet user in the world and as estimated by Forrester we’ll soon be the 3rd largest Internet using country in the world. Social Media Summit 2011 is a forum for some of the top marketers, entrepreneurs and businesses in the country to congregate and learn the scope of Social Media from experts that will help them get the sharpest edge. So, AIKYA felt that SMSin2011 will be a good platform to showcase their products and spread awareness about service to special kids. Thanks to EchoVme, Sorav Jain, and MOP Vaishnav College for their cooperation. Click here to read the Agenda (Speakers, Topic, Time) of the Social Media Summit. 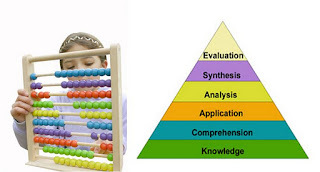 Instructional Design is the study of designing learning content or training material. After a learning or training event, the learner is expected to exhibit a positive change in knowledge, skills, and/or behavior. Keeping this positive change or learning objective in mind, an Instructional Designer has to design and then write content. Instructional Design is an art as well as science. Are you familiar with the names Bloom, Gagne, Robert Mager, and Ruth Clark? They are people who proposed several important theories and principles for Instructional Design. As a teacher, special educator, trainer, content developer, or instructional designer, you need to know the principles behind designing and developing learning content. 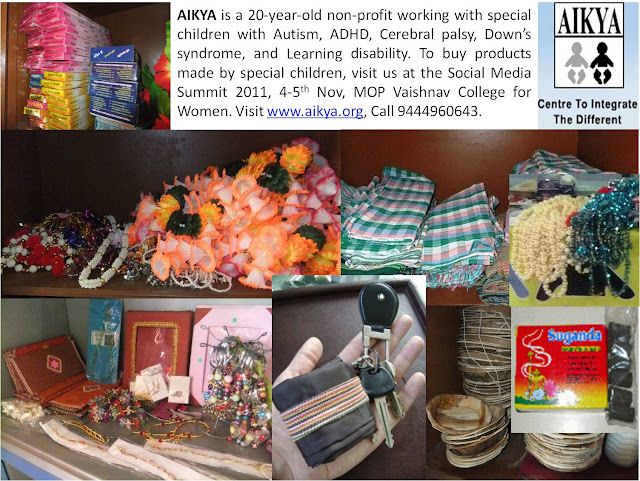 AIKYA exhibited products made by special children at Kamarajar hall on 9th October. This display was during the music show of Murali's Mouna Raagam. 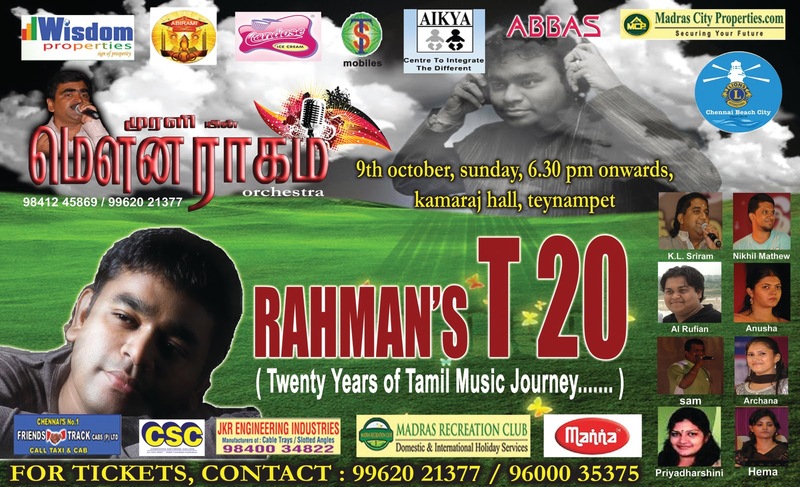 The troupe performed A.R.Rahman numbers from the movies like Uyire, Sangaman, Roja and more. AIKYA met few prospective buyers at the show. Thank u Mouna Raagam Murali. 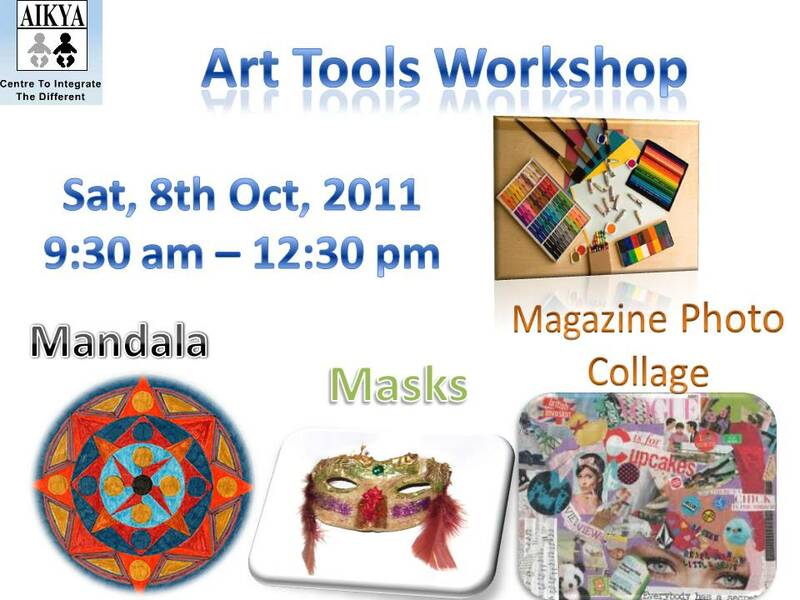 AIKYA conducted Art Tools workshop for special children, medical students, special educators, and parents. The 16 participants did Mandalas, Group Mandalas, Magazine Photo Collage, Masks and other art interventions. Drawing a Mandala was equal to meditation and the learners were asked to draw Mandalas daily in their Art Journals. Hope the training helps in emotional healing of participants. Self-advocacy refers to the civil rights movement for people with developmental disabilities, also called cognitive or intellectual disabilities, and other disabilities. It is also an important term in the disability rights movement, referring to people with disabilities taking control of their own lives, including being in charge of their own care in the medical system. The self-advocacy movement is about people with disabilities speaking up for themselves. It means that although a person with a disability may call upon the support of others, the individual is entitled to be in control of their own resources and how they are directed. It is about having the right to make life decisions without undue influence or control by others. AIKYA had Self Advocacy gathering on 24th, September. Ms. Parvathy Viswanathan spoke about how a gathering of 4000 children with ID at Valluvar Kottam in front of the then Chief Minister Mr. Karunanidhi had led to a grant of Rs.500 per month for persons with Inellectual challenges. She also spoke about SASI (Self Advocate Society of India). Even though many parents seek guidance, when a program is organized very few turn up. At the workshop, It was sad as well as inspiring to see a woman manage and help her disabled husband and disabled son. But sometimes when disabled people go for work, they are asked to clean toilets and do other menial jobs. Anitha gave a few tips on communication skills. Bobby spoke a few words about self advocacy. Zee Institute of Creative Arts (ZICA) gave certificates and CD for 10 children of AIKYA who completed an animation workshop. rt Therapy helps to improve the emotional well being of a person. Art Therapy is a form of psychotherapy. The process of creating or making different forms of art is therapeutic. So, it is "Art as Therapy." There are simple tools to practice Art Therapy. The common ones are Mandala, Magazine photo collage, Masks, and Art Journal. Anyone can learn or practice Art Therapy. There is no minimum educational qualification or drawing skills that a person needs. The client needs to understand the techniques and learn to use colors and other art aids to express themselves. The storytelling session went on well at the AIKYA centre in Chennai. The audience of 20 people included special children, parents, and special educators. All the stories were narrated in Tamil and Tanglish! Pratham Books' Champion Anitha started the session with a brief about Girl Child Day. Next she told the story "Subbu, the Signal." At the end of the story, the children recollected the traffic lights of green, orange, and red and what each color meant. The next story was "Ting Tong." The boy in the story tries to sleep but is disturbed by various noises. At the end of the story, the children were asked about the various noises that disturbed their sleep. One boy was quick to mention "generator noise"...rrrrrrrrrrr..... Another boy barked like a dog. Ting Tong story was a favorite of parents too. Parents felt that the story was simple and children could easily understand it. After the warm up with the three short stories, everyone was geared up to hear the "Ulta Pulta Girl" story. Everyone laughed when they heard that the Ulta Pulta girl could not bear the stink of dog poo. The children were glued to their seats and listened to the stories keenly. Parents were eager to know where they could purchase Pratham books in Chennai. On the whole, it was a successful event. Three cheers to Pratham Books and all the participants. To celebrate International Girl Child Day on 24th September, Pratham Books' Champions will conduct a storytelling session. The story is being written today and tomorrow by four women authors and it is about a girl who goes Ulta Pulta. What happens when she is walking around like a bat? A lot of excitement. Don't miss this beautiful story unfold in front of you in a live session. And many other stories too. Entry is free and ALL are Welcome. CIOSA organized a CoP for disabled on 22nd September, 2011. Thirteen activists participated in the discussion. Gopi of Nethrodhaya and Ms. Parvathy of AIKYA were among the participants. Lack of database and details/statistics about disabled population was a hiccup. Further issues like asking for reservation etc depends on a well-maintained computerized database. A good e-governance system for disabled must be implemented. There are 200 wards in Chennai(Tamilnadu). An active community inside each ward will interact with the corporation to check if a disabled-friendly government school exists, and if a hospital exists to give medical certificates for disabled and more. 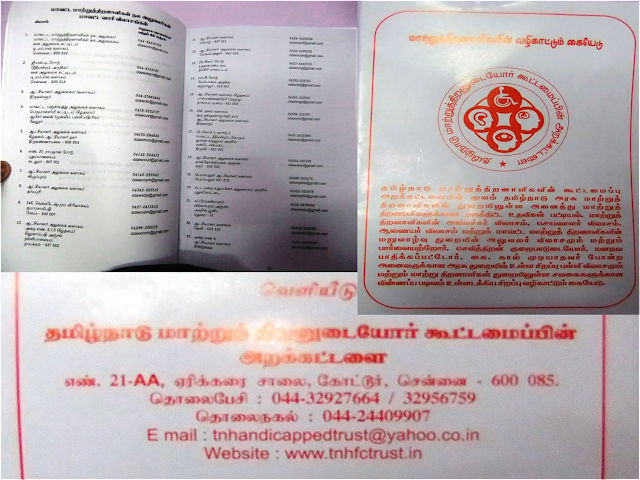 So, a role-model ward for rehabilitation of disabled, one inside and one outside Chennai has to be created. Many NGOs are not aware of the numerous central and state govt schemes that exist. So, they do not apply and get grants. 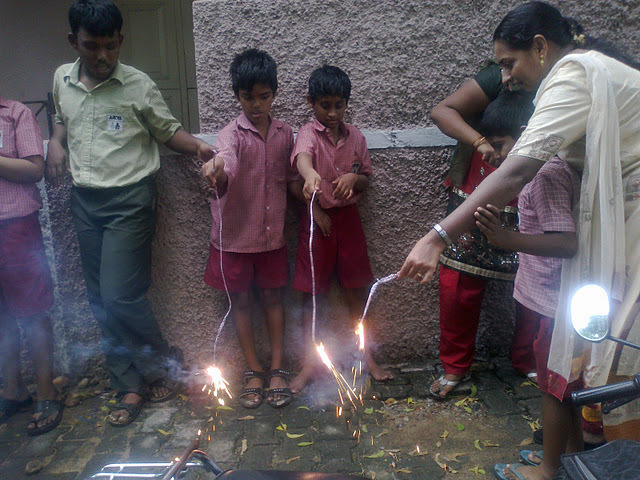 Last year, Vidyakar of Udhavum Karangal was the only NGO from Chennai who got a major grant. Disabled should be trained in new fields like cellphone repair instead of sticking to just candle making etc. DDRO office has only 6 employees instead of 17 employees. The budget for disabled group has been reduced from 237 crores to 166 crores. This reduction is due to lack of awareness and lack of manpower to implement good schemes. A decision to meet the commissioner has been made. Prior to meeting the commissioner an awareness platform with advertisements in Thinathanthi, Suryan FM , and a NGO meet will happen. AIKYA inaugurated the newborn screening program along with Mediscan and Lions club Dist 324-A5 at Mylapore on 17th September, 2011. Lion Parvathy Viswanth, Pediatrician Dr. Sudha from MediScan and Lions club Governor Mr. Nandagopoal spoke during the inauguration. Newborn screening is done by taking four drops of blood from the heel of a new born using a special syringe after 48 hours and within seven days( 1 week) after birth. The consent of parents to conduct the test is very important. In India now 5 disorders are found using newborn screening. MediScan is currently doing new born screening in 17 hospitals in Chennai and one in Ooty. Dr. Suresh of MediScan is the pioneer in India for newborn screening. MediScan offers to test adrenalin and thyroid levels in newborns at the rate of Rs. 750. Testing for all five disorders costs Rs.1200. Adrenalin disorder can lead to problems in genitalia developments and usually occur due to marriages within same family. This symptom is prevalent in the Nellore-Tamilnadu border. Thyroid related problems can lead to mental disorders, slow learning, bloated body, memory loss and more. This symptom is prevalent in the Vandaloor belt. Early detection can cure an abnormality or atleast reduce the impact of a disease. In USA, they test for 41 disorders. In USA, 1 out of every 4000 children test positive. In India, 1 out of every 1000 children test positive!. In India, you need to increase and spread awareness about the importance of newborn screening. Let us know if you need to address a crowd of 25 to 30 people about NewBorn screening. AIKYA can arrange for the event. You can also sponsor a newborn screening. Mail info@aikya.org or call 9444960643. You may consult with us on any issues related to special needs. You may ask questions related to your child's behaviour, mangement, education, reading writing skills, training in any skill.